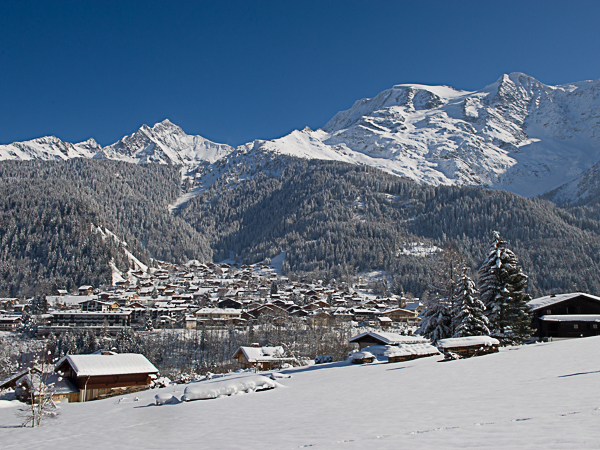 The village sits between the Chamonix Valley and Megève in the Val d’Arly, but unlike its far better known neighbours, the village remains a relatively hidden gem. Thanks to its location at the head of a valley at the base of Mont Blanc, the ski resort of Les Contamines has an enviable snow record, with the skiing taking place on predominantly north-east facing slopes which hold their snow well, against the dramatic back drop of Mont Blanc. Les Contamines, with its 120km of more challenging pistes, favours confident and competent skiers looking for a natural mountain setting, with a tucked away feel, and who are looking to make the most from a weekend or midweek ski short break. If we are honest, Les Contamines is not the best resort for absolute beginners, with limited nursery slopes and only a few green runs. For skiers who have progressed beyond the nursery slopes – typical ‘second weekers’ – Les Contamines does offer the opportunity to gain confidence on some of the wide, gently rolling pistes. There is even some fantastic and easy ‘off-piste’ skiing between the pistes. 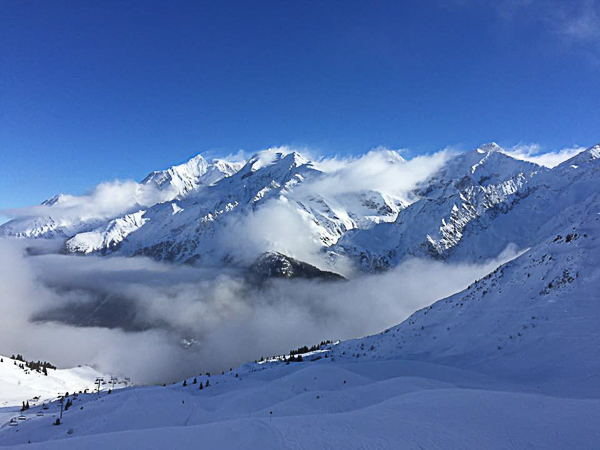 The ski area has some stunning views over towards Mont Blanc, and the lower, tree-lined pistes are great confidence builders. 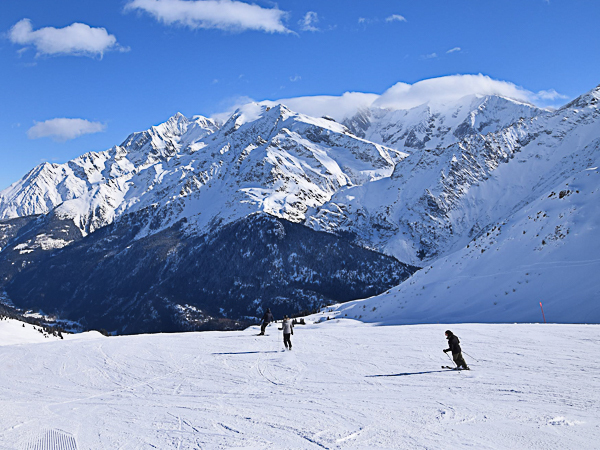 Intermediate skiers will love the terrain that Les Contamines has on offer, as well as being able to take advantage of some traditonal mountain restaurants dotted around the domain. 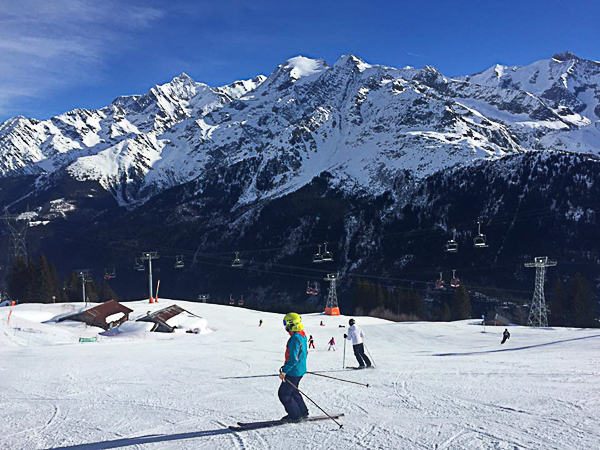 The resort has good, reliable snow conditions and most of the skiing is in the 1700m to 2300m range – with the highest lift taking you to 2500m. Lovers of cruisy blue runs have a good selection of quite long runs, including some stunning drops in to the Hauteluce sector, whilst the steep reds, set amidst the stunning and unspoilt surroundings around the Montjoie sector, provide exciting skiing amongst some incredible scenery. Advanced skiers and snow boarders looking for a back-to-nature mountain skiing experience, set amongst incredibly dramatic scenery, will love the challenges on offer here. The Toboggan, Olympic and Belleville slopes provide some exciting skiing, and for something altogether more testing, take a trip up the draglift to Veleray 2450 to access the black-graded Rebans, and a challenging drop back down to 1577m. A highlight of Les Contamines are the multiple X Zones, developed to appeal to the free-ride generation. For lovers of aerial action and acrobatics, The X Zone des Loyers and the X Zone de Tierces are a must, whilst the the Super-Pipe, which hosts rounds of the World Cup, is the pride of the resort.